Three titles in, filmmaker S. Craig Zahler has brought a whole new polish to the B movie. 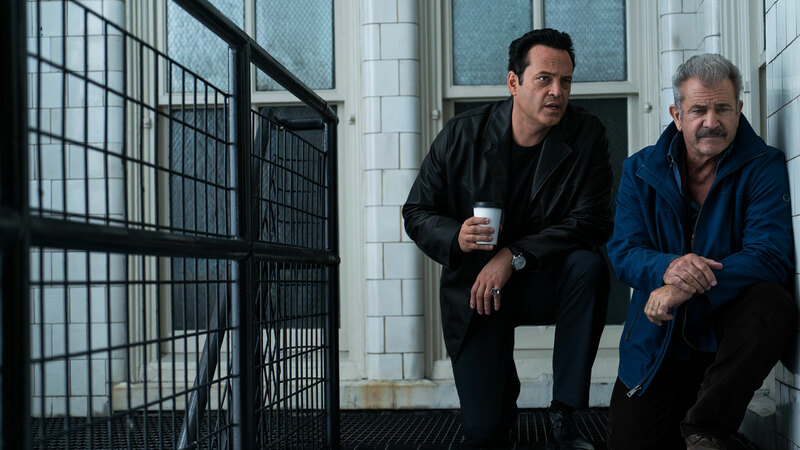 Whether it was a take on the Western with Bone Tomahawk, the prison movie with Brawl in Cell Block 99, or now the crooked cop drama with Dragged Across Concrete, Zahler is operating in a realm all his own. Brutally violent, lyrical in its dialogue, and perversely unique, he’s a singular storyteller. You likely love him or you hate him, but there’s no dismissing him. I’ve enjoyed both of his previous features, though you can actually make the case that his new effort is his both his most indulgent and most restrained yet. It might also be his best total product too. The movie is a slow burn crime drama. First off, we meet Henry Johns (Tory Kittles), who is just out of prison. He’s coming home to a less than ideal family situation, signaling almost immediately that he’ll be returning to the life of crime he had prior to incarceration. Next, we meet a pair of cops waiting to make a bust. 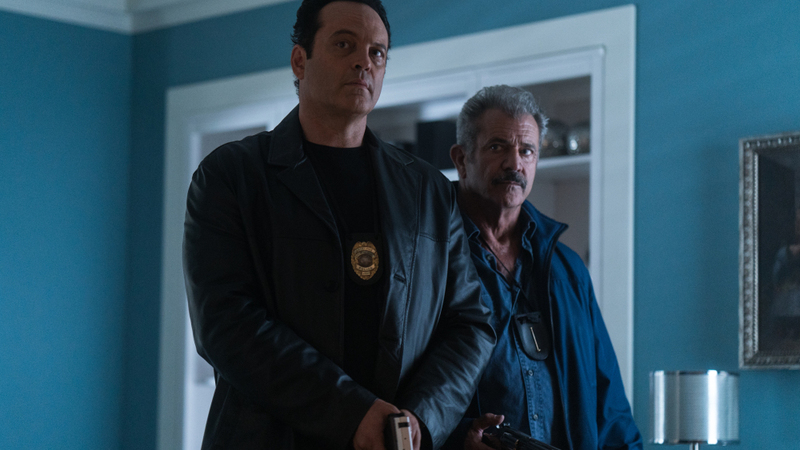 One is an old-timer in Brett Ridgeman (Mel Gibson), while the other is his volatile younger partner Anthony Lurasetti (Vince Vaughn). The former has never been promoted up the chain of command, largely due to his old fashioned, non politically correct, and largely racist views. The latter is following in his footsteps, probably without any help. They collar a bad dude, but in doing so, are caught on camera using some fairly rough tactics. Their superior Lt. Calvert (Don Johnson) informs them that they’re not fired, but they are going to be suspended for a bit. Ridgeman has a wife (Laurie Holden) struggling with MS and a daughter dealing with neighborhood bullies, so he needs money to move his family to a safer spot. Lurasetti is planning on proposing to his girlfriend, but wants more stability. Looking to make some easy money, Ridgeman uses an old contact to get a job within the criminal underworld, recruiting Lurasetti for help. Of course, nothing goes as planned, and they end up involving with some very dangerous people, the same ones that Henry from earlier is now caught up with. Zahler writes and directs, as well as composed the score with Jeff Herriott and The O’Jays. Cinematography is by Benji Bakshi. 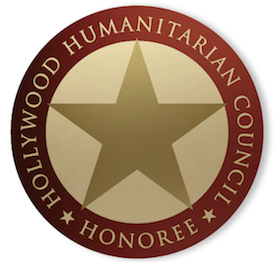 Supporting players include returning collaborators like Jennifer Carpenter, Udo Kier, and Fred Melamed, along with Thomas Kretschmann, Michael Jai White, and more. I was surprised how effective I found this flick to be. Gibson hasn’t been this great since The Beaver, leaning into the racism and corruption of his character, but still giving you a perspective on why he might be the way he is. Vaughn gets the best lines and aces them, showing that his terrific turn last in Brawl in Cell Block 99 was no fluke. The dialogue between Gibson and Vaughn shines, while many of the action set pieces or police actions take place in nearly real time. That manages to build insane amounts of tension. Knowing Zahler, something violent is inevitable, but this is way more of a character study than he’s put forward before. How much you like this film will probably depend on how much you like Zahler’s previous outings. For yours truly, it was largely captivating, making over two and a half hours fly by. If Bone Tomahawk or Brawl in Cell Block 99 floated your boat, so too will Dragged Across Concrete. In fact, it may even appeal to a broader audience. Sure, it’s way too long, but it never drags. The flick has the brutal violence that Zahler has made his signature, but there’s less of it here. His exaggerated dialogue is on display, as is some decidedly politically incorrect comments. In fact, the supposed conservative leanings that his last picture had, while somewhat in evidence here, are more just coloring for the characters. Gibson and Vaughn are playing bad men. Complicated men, to be sure, but characters not meant to be approved of or identified with. The downward spiral they encounter is earned. It might turn some off, but for me, it oddly made for a compelling experience. This weekend, audiences who have dug on the prior two movies of Zahler will be in for a supersized treat when Dragged Across Concrete opens. If he doesn’t do it for you, this likely won’t change your mind. Similarly, if Gibson is problematic to you, his strong turn won’t convince you to buy a ticket. That’s your prerogative. Judged just on the merits, this is a really good film, albeit one that could stand to be shorter. That aside, Zahler continues to show that he’s one of the most interesting and uncompromising storytellers in the business. This latest effort will hammer it home with authority. Be sure to check out Dragged Across Concrete, in theaters and On Demand this week!